The four big names of French sailing came together this morning in La Grande Motte to celebrate the twentieth anniversary of the Trophée Clairefontaine des Champions de Voile this weekend. Franck Cammas (Team Groupama), Michel Desjoyeaux (Team Foncia), Loïck Peyron (Team Oman Sail Masirah) and Pascal Bidégorry (Team Banque Populaire) will participate in the Trophée Clairefontaine on spectacular runs lasting less than ten minutes before the general public. With the wind forecast, the sailing show promises to be exciting. No one has ever ranked the famous big names in tenors Placido Domingo, José Carreras and Luciano Pavarotti together. 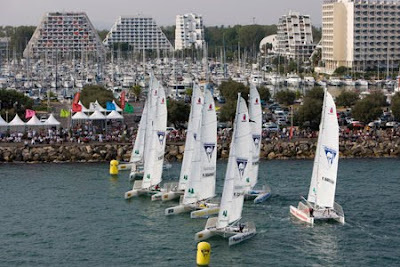 Similar to them, the four big names in French sailing are incomparable, such is their excellence in their own register. However, the Trophée Clairefontaine is an equal opportunity race and moreover, one of them must stand on the top step of the podium on Sunday, among the crowd at approximately 16:00, unless the four other champions invited to this 21st Trophée Clairefontaine dominate over Neptune's musketeers. The betting is on. The teams competing at the 21st edition of the Trophée Clairefontaine. Image copyright Jean-Marie Liot/SailingOne. Franck Cammas, winner last year in La Grande Motte, but also in 2000 and 2006, will defend his title of "Champion of Champions 2009". He is holder of the Trophée Jules Verne (round-the-world record) on the giant trimaran Groupama 3. Loïck Peyron, seven times winner of the Trophée Clairefontaine, only ever missed this important 1st of season meeting of champions in the year 2000. Michel Desjoyeaux, the most titled single-handed sailor in the world, has already won the Trophée Clairefontaine four times (2001, 2003, 2004 and 2007). Pascal Bidégorry is invited for his Atlantic Crossing Record (3 d, 15 ', 25"), the Speed Record in 24 hours (908 miles) on the maxi trimaran Banque Populaire V, and also for his recent Mediterranean Crossing record. Team Alinghi, twice winner of the America's Cup (2003 and 2007) won the Valencia 2008 Trophée Clairefontaine (Spain). The Swiss crew is back this season, with Luc Dubois at the helm, Pierre-Yves Jorand and Yves Detray. Nicolas Charbonnier, silver medallist in the Peking Olympic Games 2008 and silver medallist in the European 470 Championship 2010, is a driving force in the Trophée Clairefontaine. His contribution to the show is important. Armel Le Cléac'h is invited for his victory in the Transat AG2R - La Mondiale 2010 on Brit Air and for his victories in La Solitaire du Figaro this summer and in 2003. Serge Madec is back twenty years after opening the Trophée Clairefontaine honours list. Since it began in 1990, and therefore for the 21st consecutive time, the Trophée Clairefontaine is the only event in the world to bring together champions from such a variety of disciplines in international sailing, with strictly equal opportunity, on spectacular and completely identical 7.65 metre (25 foot) catamarans exclusively designed and used only for this sailing event.